I received compensation for this post, but all opinions are completely my own, and I only recommend products I truly love. This post also contains affiliate links when possible. Thanks for supporting Persia Lou! 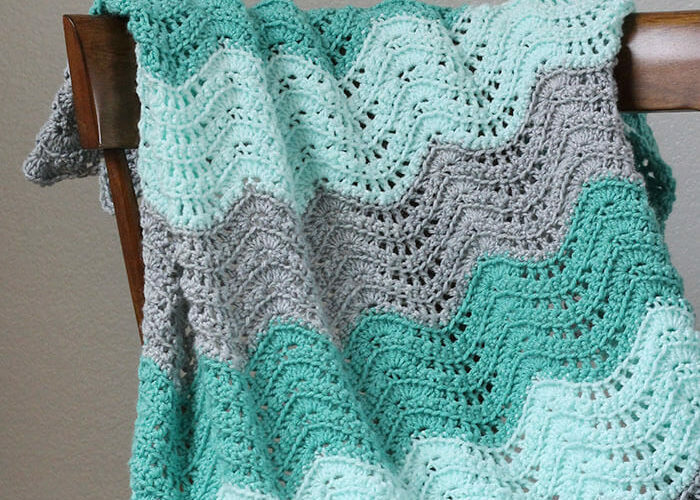 I am super duper excited to share today’s project with you all! Is it weird for me to say that I think it’s pretty awesome? I really, really like it. Maybe it’s just because this was one of those (extremely) rare projects that went off without any problems and came out exactly as I pictured it in my mind. Yeah, that doesn’t happen very often. Anyway, I’ve already shared my love for the Heidi Swapp Minc and it’s foil applicator magic with you all, but I wanted to try to step up my foil game. So to really show off what this little machine can do, I decided to try for a multi-colored print on dark paper so the foil could really shine. 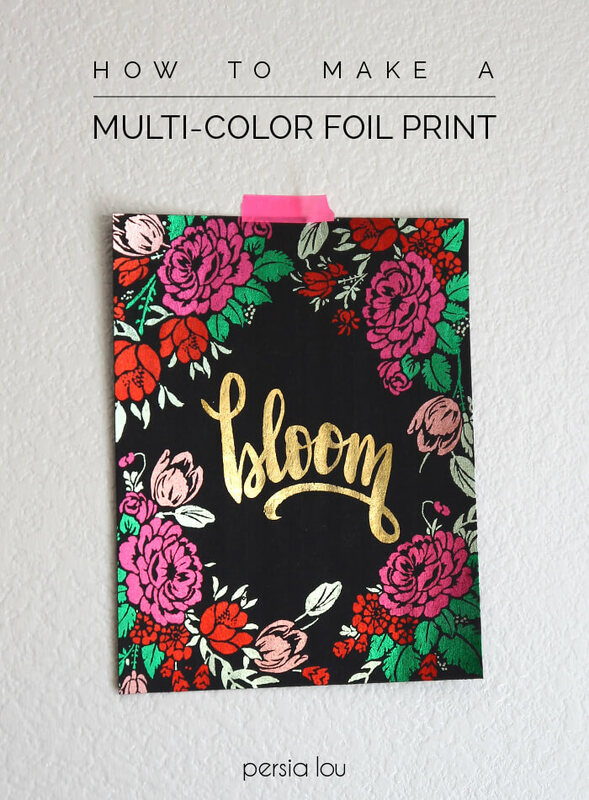 I ended up with this pretty “Bloom” floral print that is perfect for Spring. 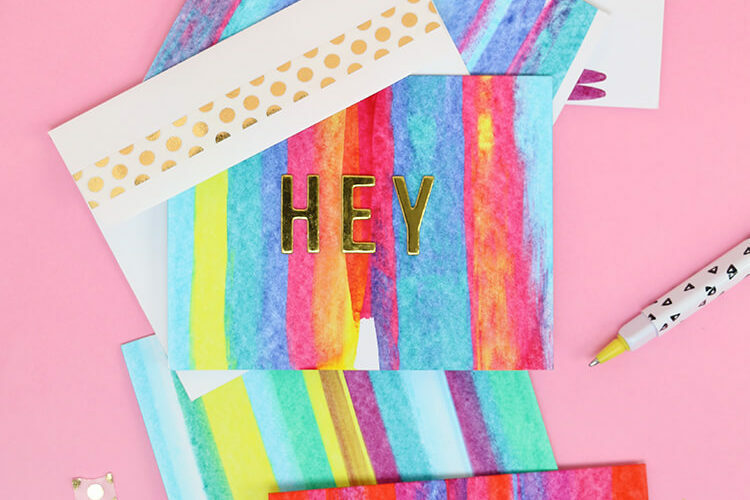 The trick to making multi-colored foil prints is properly preparing your image before your print it. To do this, you will need to use photo editing software that allows you to break an image up into different layers. I used photoshop, but gimp is a good free alternative. To create my image, I used flower dingbats from Intellecta Design‘s Floreale Two font, but this same technique should work with any solid black on white design. The key is to determine which parts of the image will be what colors and to then separate each color into it’s own layer. The first image contains all of the floral frame, and in the second image I have separated just the portions I wanted to be pink into a separate layer. I ended up with six layers in total – one for each color I used. Select one of the layers and make only that layer visible. You can make a layer visible or invisible by clicking on the little eye icon next to the layer. When only the layer you want to print is visible, go ahead and send it to your laser printer loaded with black cardstock (the Minc will only work with images printed with a laser printer). 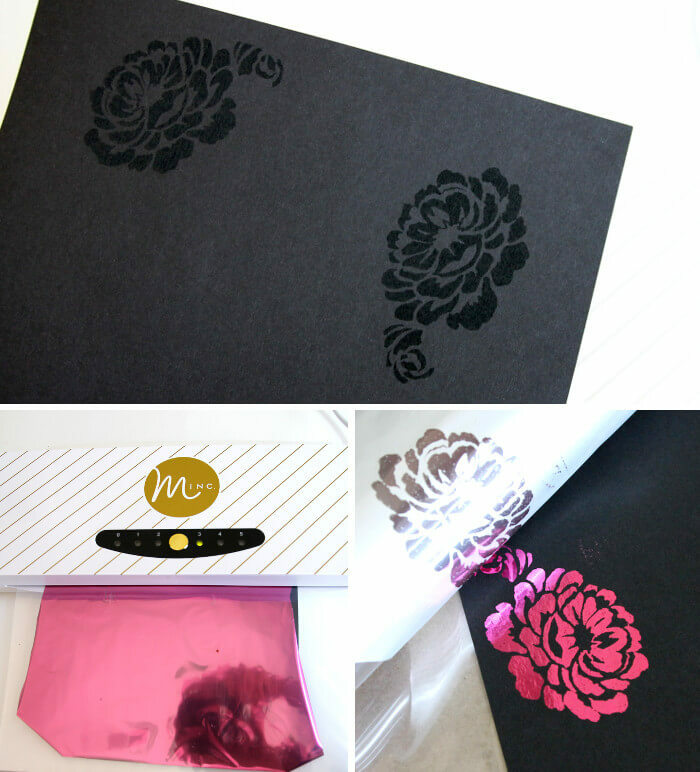 Then, place your print with the colored foil on top of the toner into one of the Minc folders and send it through the Minc. 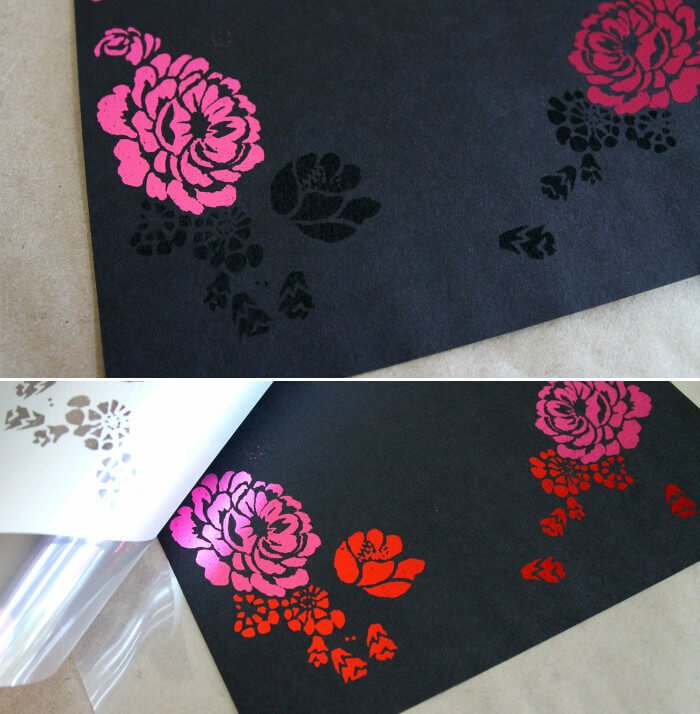 Hands-down, my favorite step is peeling back that foil and seeing the pretty, shiny results. Yay! Those hot pink roses are DONE. Time for red. Load the same piece of paper back into your printer making sure it is inserted correctly so the next color will print in the right place. Then go back to your computer and make it so only the next layer is visible. And, print! Seriously, every time I peel off the foil I do a little happy dance. It’s so amazing!! I repeated this process of printing each layer one at a time and adding each color of foil. Finally, I trimmed off the excess, and it was all done! I’m thinking about shrinking the image down and turning it into a Mother’s Day car with a different word or phrase in the center. What do you all think? Is this a technique you’d like to try out? If you liked this post, I’d love it if you pinned the image below. Thanks! thanks! i got my minc the first release day (and cheap) and have been obsessed with it every since – i just can’t get enough. i hadn’t tried doing multi colors yet so i really appreciate you showing how!! minc on! You are welcome! 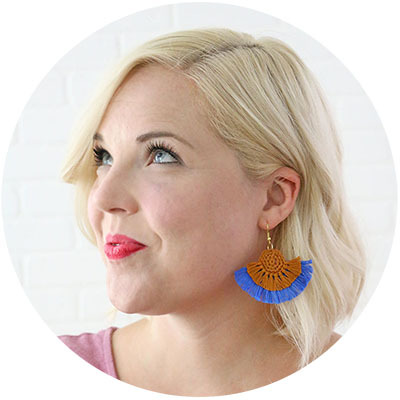 I am obsessed too – I have been dreaming up projects constantly! Squeeeee! That’s it. I simply MUST get my own laser printer! I was really lucky we already had one! Love this! My husband suggested last night, trying to put a foiled page through the printer a second time, and I didn’t know if it would work. So glad to read your post today and find out it is possible! Thank you! I was SO happy when it worked! I am SO excited to get one of these bad boys! Such a gem! It turned out fantastic! The gold text is just perfect! LOVE this!! The multiple layers and colors is pure genius!! I am going to try it!! Thank you!! It is so fun to play with. you are a genius!! I love love love this! I don’t know about genius, but I will take it! Thanks, Mandy! I adore this! I was wondering if you could tell me which brand of black paper you used? I’ve tried a few different ones I had on hand (cardstock of varying weights) with no luck… tried about every setting on my laser printers and I can’t get a good enough layer of toner for total coverage, my attempts have a chalkboard look. Thanks! Hi Candi! I used some black cardstock I picked up at Hobby Lobby. I don’t have the label any longer, but it was a pack of maybe 40 sheets of black cardstock. I think about 65 lb weight. Hope that’s helpful! Oh my goodness this is just GORGEOUS! My heart is now pining for a Minc! Ah! Also, that Valentine from your hubby is just too stinking cute! Do you ever have problems with the foil not “sticking”? I have run it through after printing cardstock on my laser printer and tried it in settings 2, 3, and 4, and have black that shows through like crazy – it looks awful 🙁 I have only had success with one type of white paper. I have a professional laser printer so am curious what paper types you have had the most success with, if you don’t mind sharing? I have had a few small black spots here and there but not lots of black spots. When I was at Snap conference, the representative working the Minc booth said that some printers work better than others, and that a more expensive printer might not necessarily work better. I have mostly printed on cardstock and haven’t had any problems. That’s interesting that one type of paper has worked better for you than others. What kind of paper is it? Does it have more texture than the other papers you have used? I wonder too if maybe using a higher heat setting might help? I’m sorry – I’m not sure if any of that is helpful at all. Good luck! Hi Brianna! My printer is this Lexmark (http://amzn.to/1X3428b). American Crafts has recommended this inexpensive HP (http://amzn.to/1X3493D). Thanks for stopping by and good luck! I am so excited. I just found your post (and pinned it, too). I love your foil printing on dark card stock. Layering colors is brilliant. 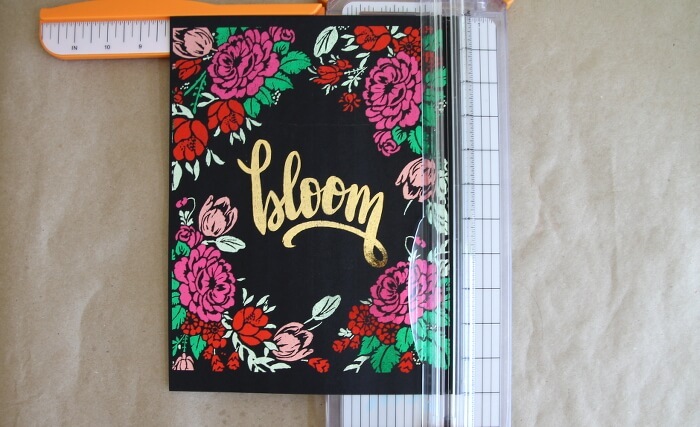 Would you mind sharing what font you used for the “bloom” text? I love it. Thanks so much for your reply. 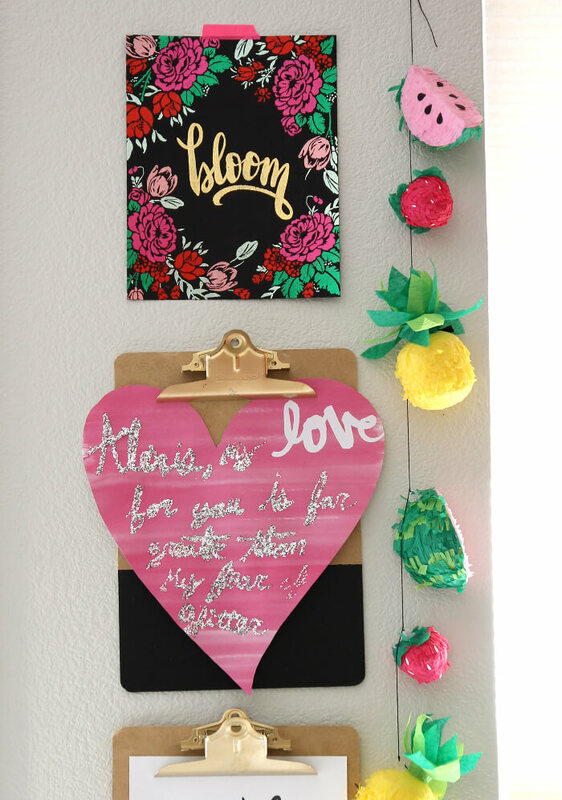 I’m truly envious of your hand lettering talents. Thanks, too, for sharing your ideas/inspiration with all of your readers! I LOVE THIS !! So … the heat of the printer didn’t disturb the foil that was already down ? That opens endless doors ! Thank you so much !! Hiya – as I don’t have a laser printer I went to my local print shop and they said they can’t print on black paper because the printer won’t be able to ‘see’ the paper? What kind of black paper did you use? Hmm… I guess they much have a much fancier printer than I have. I think most copiers and printers just feed the paper through, they don’t really “see” it at all, right? I just used regular old black cardstock in my printer and had no problem. Can you use a copier and put your own paper into it? Hi! I absolutely love this! So you don’t have to worry about foil sticking to spots that have already been foiled? Does that make sense? The foil stays when rerunning through the printer with no issues? Hi Amanda! Nope! The toner is heat activated, so once it has been through the Minc (or your laminator if you are using that), it won’t stick again. And I haven’t had any problem running the paper with foil on it through my printer. The foil is super thin. Hope that helps! Good luck! Hi Alexis, you may have just unintentionally solved my ongoing problem! I’m trying to print a full-colors image with only certain parts of it foiled. Could I send the whole thing through a laminator first (to heat the toner), re-print the parts I want foiled, and run through a second time with the foil? That would be amazing! But is that how it works? Once the toner has been heat activated once it won’t react again? Thank you so much! Hi Laura! Yes. As I understand it, the toner should not react to the foil after it has already gone through the laminator. I would definitely do a little test run on a scrap to check before running your full project through, but I think it should work! Good luck! This is awesome! My fiance and I are using this technique to make our wedding save-the-dates. We have a layer created that we print first, and foil with gold, then reprint a design in color. Any tips for making the prints line up? When we do our second print, most of the designs are slightly our of alignment. I realize that it’s nearly impossible to get the paper to go through the printer EXACTLY the same way twice in a row (except by chance), but surely there’s a trick to get it as close as possible. Any thoughts would be greatly appreciated! Hi Meg! First off, congrats on your engagment! How exciting! Secondly, What a great idea! I’m sure your wedding save the dates are going to be gorgeous! As for your problem, I did run into this problem a bit when I tried it with another design that was more precise (I was trying to foil the text a different color than the background), and I didn’t have a lot of great success in getting it to line up exactly perfectly. It worked great for this floral design because it was more organic and the placement being slightly off wasn’t noticeable. I don’t have any great tips for getting it to go through the printer perfectly. My best suggestion would be to play with your design a bit (if you can) to leave a bit of breathing room around the different elements so if it prints a bit off it won’t be very noticeable. I also wanted to mention that there are toner paints and inks available (here’s one – http://amzn.to/2c9TSRn – that’s an affiliate link), which might be another option for you if you want it just perfectly lined up. Maybe a stencil? Anyway – I hope some of that is helpful for you! Good luck! 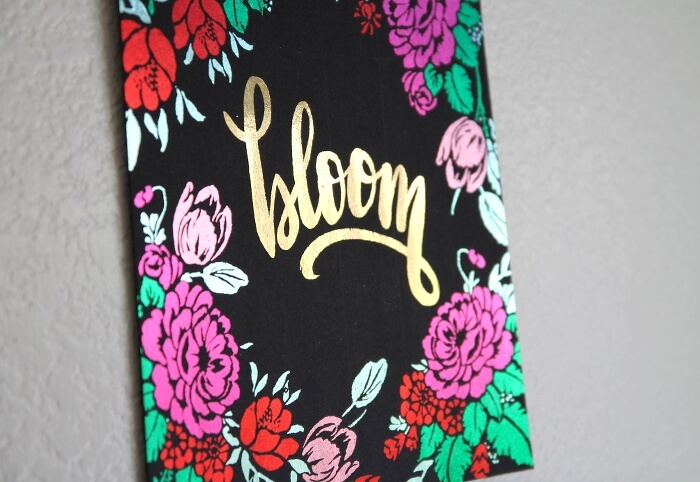 My goal is to have a print with only one or two words gold foiled. Do you know how I can do that? I tried printing out my design, placing the gold foil over just that one word and running it through the machine. That one word did get foiled but the heat must have hit the non covered words badly. The remaining words transferred right onto my sleeve! 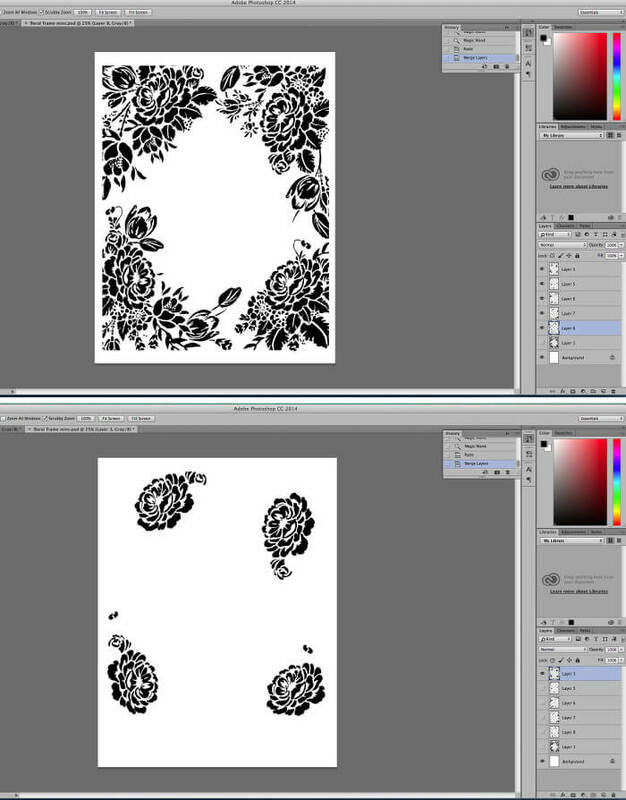 So did my flower graphics! Uh oh! Am I only supposed to cover the entire print in foil and not just a few words? Your post sparked an idea. Perhaps I need to separate my design onto layers. 1 layer is the words I do want foiled and the other layer to be printed later after the foiling happens is the rest of the design? Hi Chloe! Yes, I think your plan should work. Start with the foiled layer, then print the non-foiled layer. Just know, that this works better for some designs than others. Try to leave some space in your design so that if the layers do not line up perfectly, it will still look nice. 🙂 Good luck!